I received tickets to attend the show for this review. All opinions are my own. Every once in a while the 4 of us need to go out together without our toddler. Just somewhere special for my boys to spend some quality time with us doing things that aren’t as conducive to toting a toddler around. 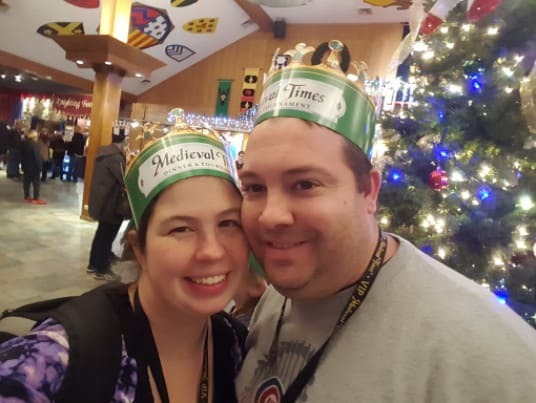 Last weekend that was a special trip to Medieval Times! For the biggest WOW factor don’t tell the kids! 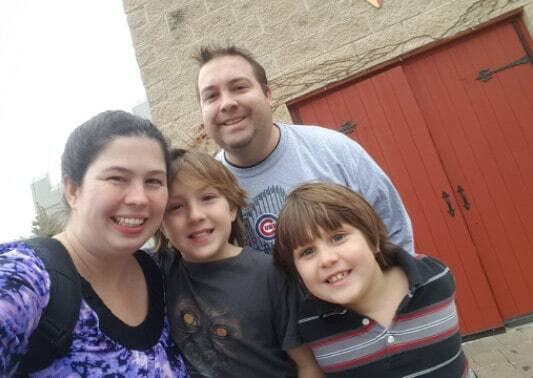 The outside of the building is a HUGE castle so my kids were pretty psyched when we pulled up! As soon as you walk in the doors your adventure begins. You’ll see all sorts of decorations like the shields we looked at above! Take photos of the shields so your kids can research their meanings later! I recommend arriving an hour before your showtime starts. There is a lot to see and do before they open the doors! 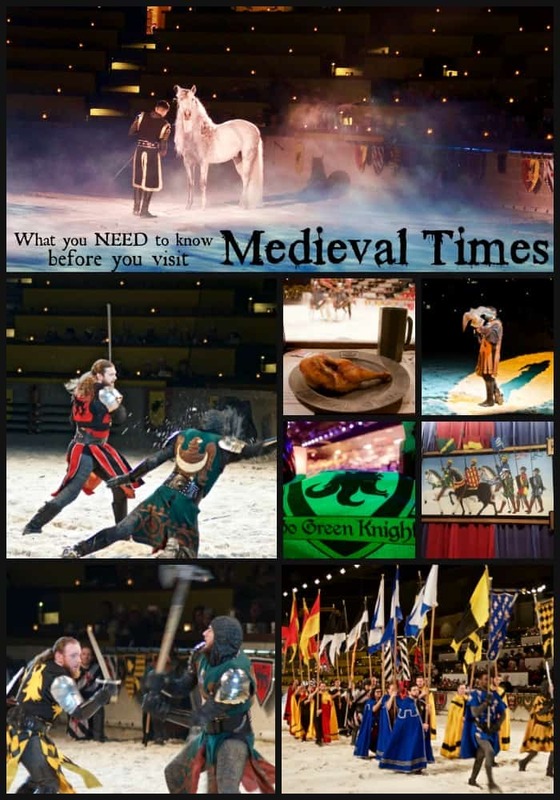 From gorgeous tapestries, royal thrones to sit in and pose for photos, real weapons in the gift shops, the horse stables where you can see some of the horses being prepped for the show, and medieval weapons hung on display. We also came across an actor holding a Peregrine Falcon before the show who talked with us as we learned all about the bird, their skills in flight and prey as well as other tidbits of educational facts. I also recommend bringing $2 per person for the Dungeon Museum! 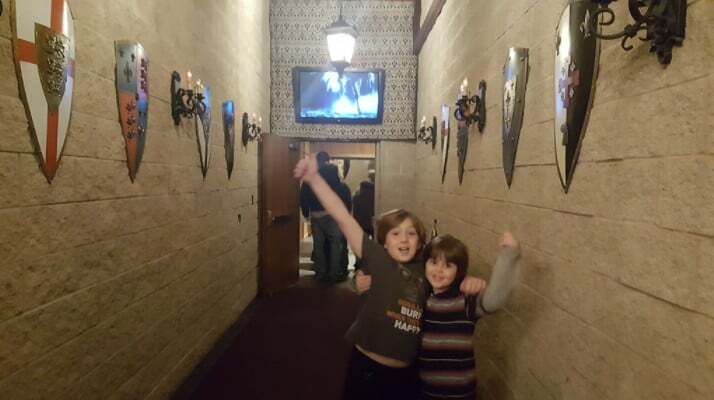 Several years ago when we visited we were deterred from entering the Dungeon Museum because of all of the warning signs for kids that might be frightened so we weren’t sure what to expect. We were afraid of gory graphic statues, but this time we did pay to go in and we’re glad we did! There were no grotesque or gory/bloody displays. Instead we found walkways with medieval torture devices and plackards describing the function of each weapon – it was quite informative! Even I had never heard of some of these devices! When you arrive you’ll receive a team color (we were green!) 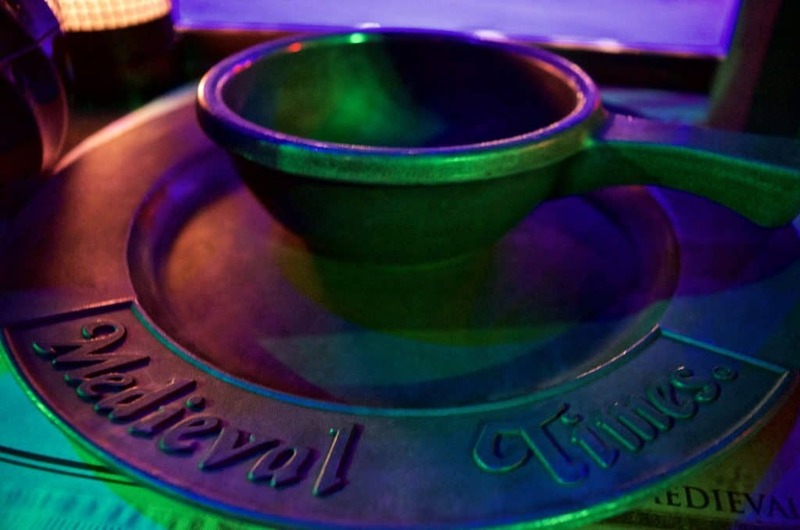 as well as crowns in that color and a table in your color’s section. 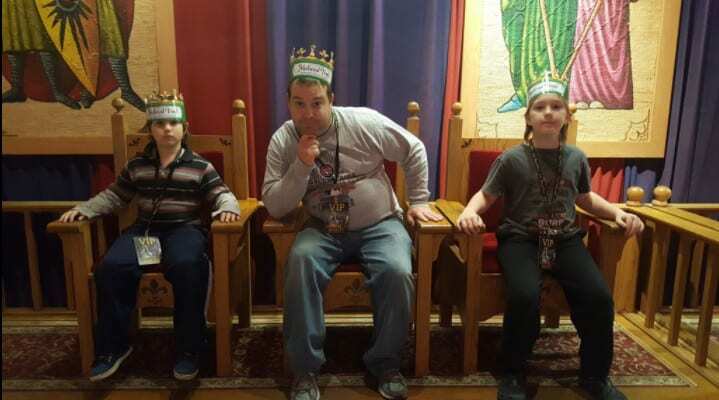 We were upgraded to the Royalty Package which was a real treat for our family and I definitely recommend it! 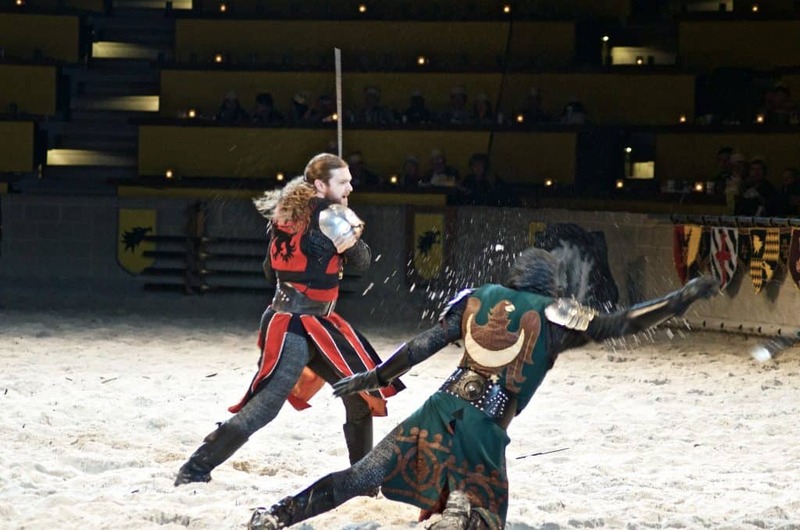 We sat in the front row which added a heightened dimension of sensory experience being on the level of the actors on horses and face to face with the horses as they came near our area! The entire building is festive! Notice that there are no silverware in the photo? That’s because you do NOT receive any! Everything you are served for your meal is insanely delicious and can be eaten with your hands. Don’t worry – they included wipes for you to use! I actually really love the dish set and wish I could have bought some! 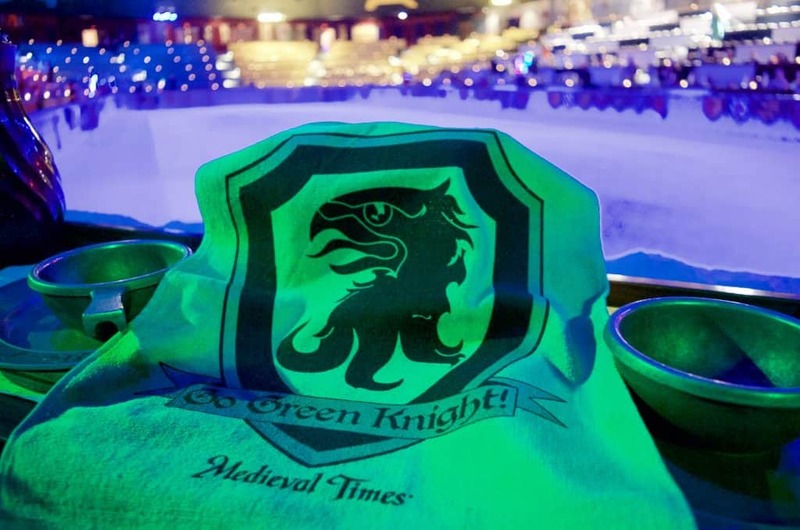 As part of the Royalty Package we also received hand towels for each of us with our team color and flags to wave around for the knight we were rooting for. The flags are for sale for a few bucks during the performance as well. 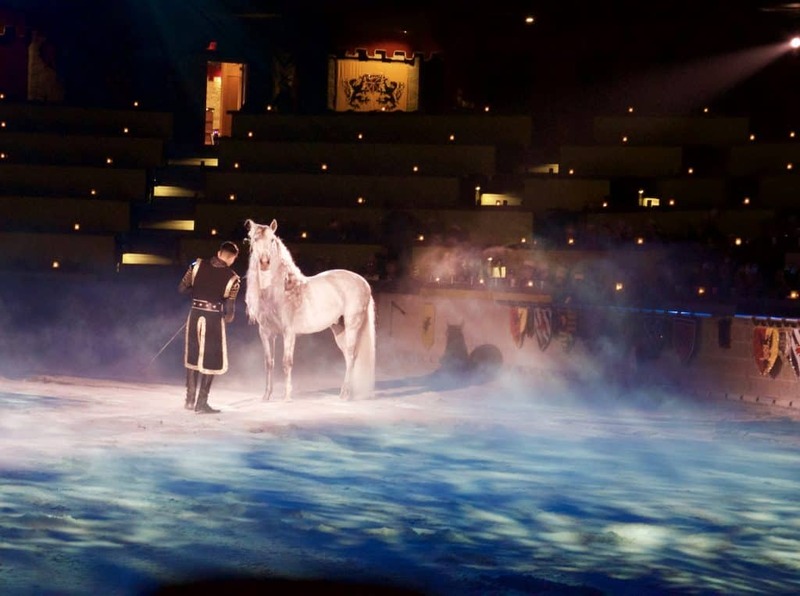 The show starts out with a beautiful entrance and show of the horses. It was exquisite and felt like I was watching a wild horse run around in a dreamy foggy field. You can tell they really care for their animals! The entire program had a massive force of actors and actresses behind it – all the way down to those serving the food! It was a phenomenal experience. Here is the Peregrine Falcon I mentioned earlier! 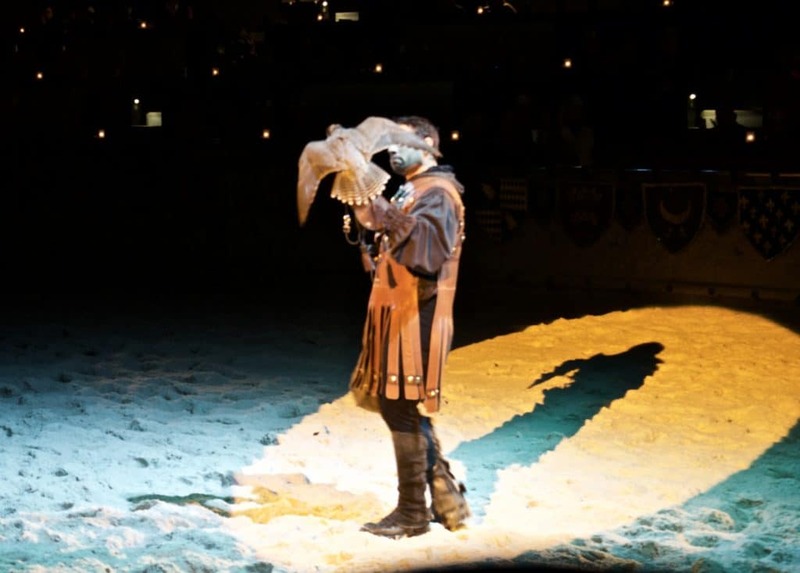 It is used during the show and flies around so you can see their natural flight pattern and how these birds were used in medieval times. 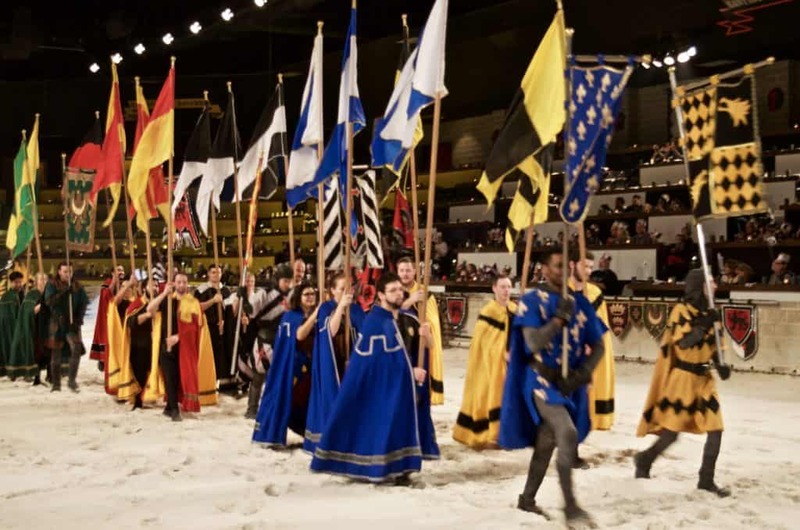 As each knight’s colored team competes to win the hand of the princess you’ll see traditional medieval games being played as the knights gallop on horses across the center arena. 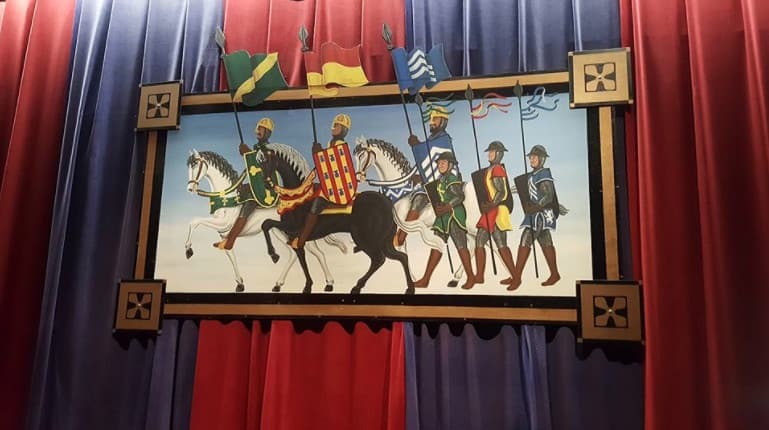 There’s even a real jousting session! Although the knights take precaution and safety seriously it’s a real set up! As the entertainment progresses through the night the battle intensifies with hand to hand combat. 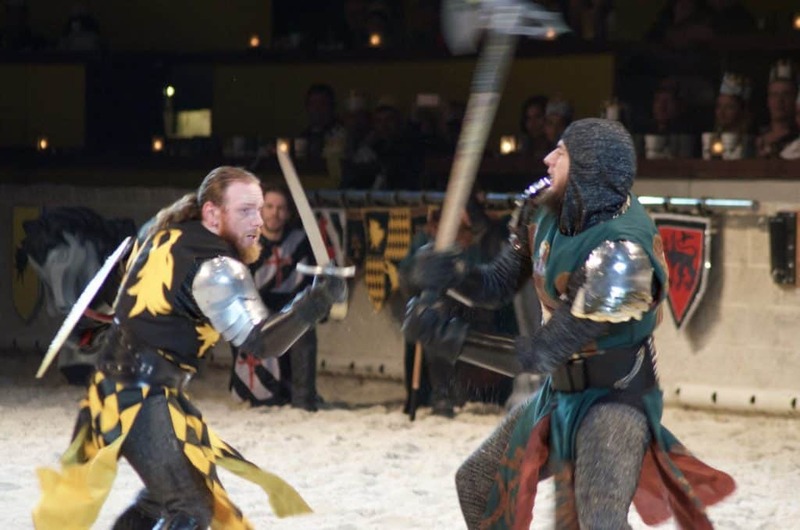 These are REAL weapons used – one of the photos I took (although fuzzy) showed up with a massive amount of sparks that you can see during the show as the swords clang against each other. In fact there was a variety of weapons used during the performance that make great research points for your kids later! 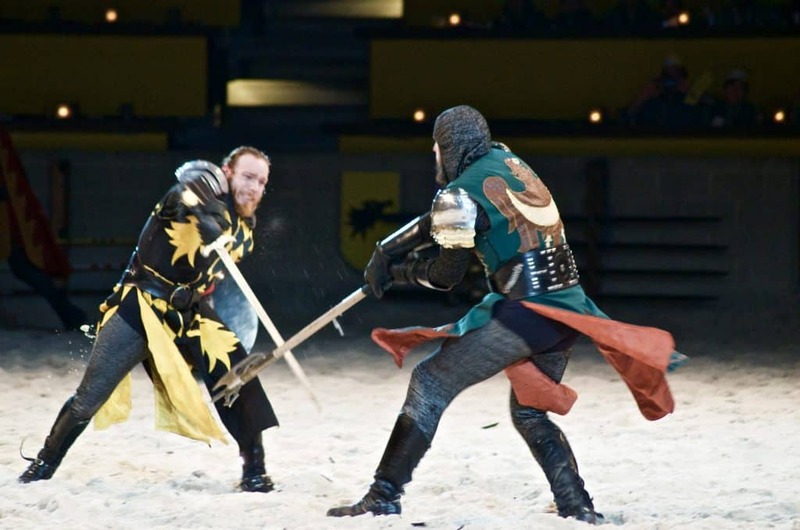 Since the middle arena is covered in sand it really adds to the dramatic effect of the battles as sand is flying around. 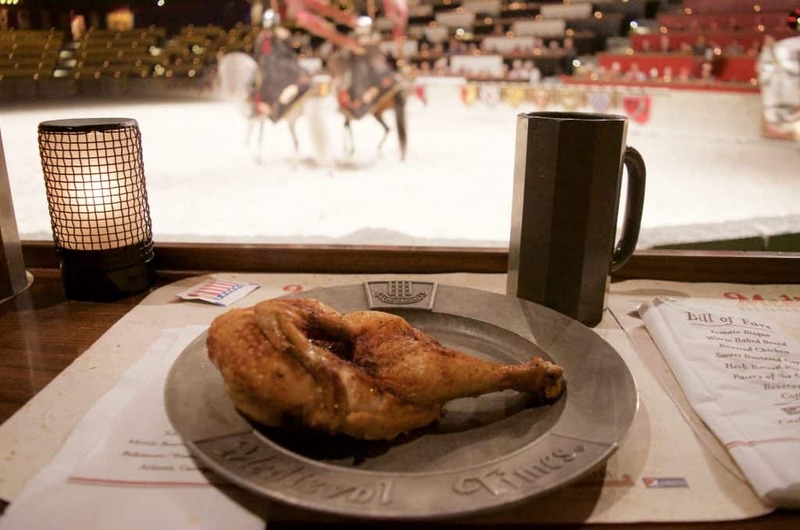 If you’re thinking of going to Medieval Times I recommend saving up and taking advantage of the Royalty Package! It was awesome and came “built in” with souvenirs! And if you’re looking for a deal on tickets check out the special sale below!